What could be better than watching your pup curl up with a favorite toy? Soon enough, that plaything will get snuggled, gnawed and loved to death. 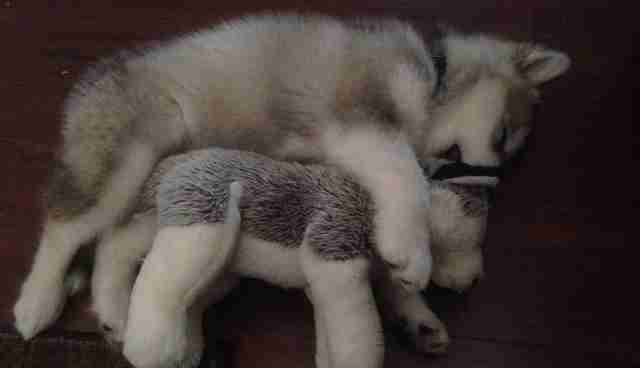 In the case of this adorable Alaskan Malamute, though, one beloved toy has survived for years, a rarity even in this dog's household. 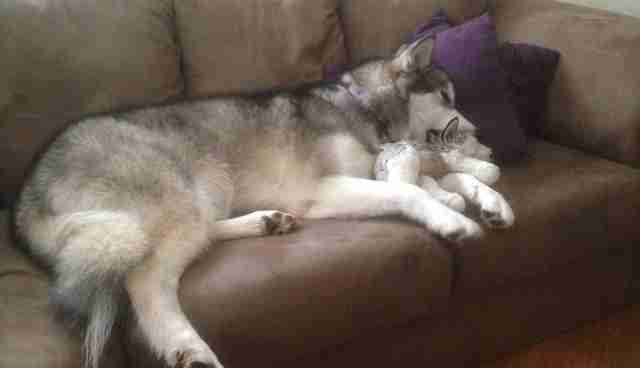 "She destroys every stuffed animal except this one," the dog's owner wrote on Reddit. And what is this toy, exactly? A mini-me stuffed animal, identical to the dog who loves it. Today, the two spoon on the sofa just like they always have. It's just that now, instead of being almost the same size, the extra large-sized dog hangs off the couch-and onto her lifelong friend, a younger, tinier, fuzzier replica of herself.